Dreaming of a white, "tactical" Christmas? 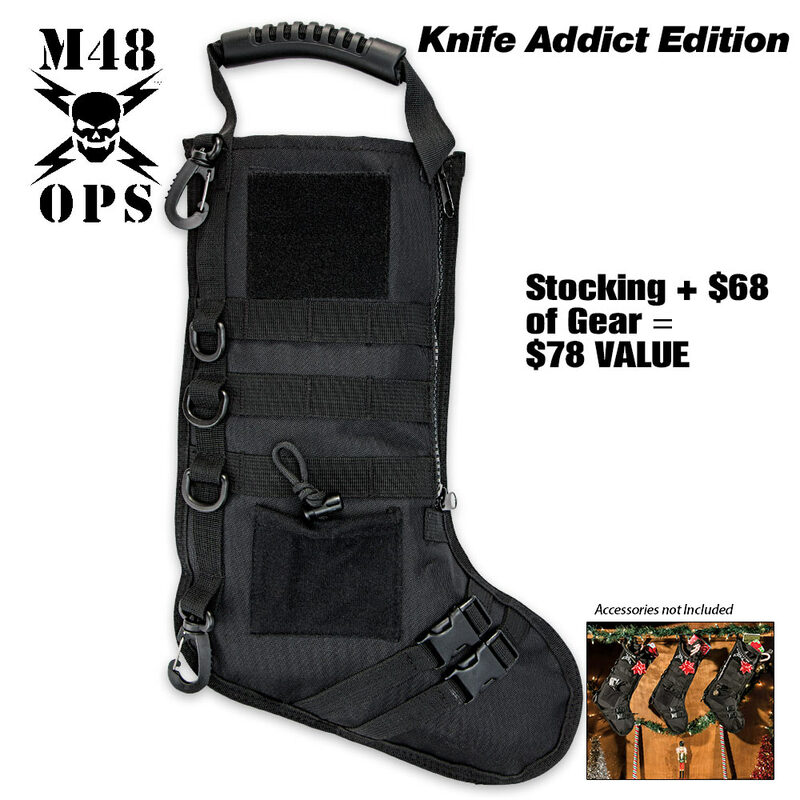 Hang M48's gear-stuffed "Knife Addict" Tactical Stocking above your fireplace, and turn your dream into a reality! A far cry from ordinary felt Christmas stockings, the M48 Tactical Stocking is made of rugged 600D polyester and features a heavy duty metal zipper, tough rubberized handle, convenient D-rings, handy storage pockets, MOLLE compatibility and more! Best of all, it comes brimming with a wide assortment of premium folders and fixed blade knives, together valued at more than 68! This represents a tremendous savings over buying the items individually, and, with everything conveniently in one place, you won't have to scour the Web or catalogs seeking out those perfect gift ideas. Surprise your loved ones on Christmas morning by replacing your usual stockings with these eye-catching tactical alternatives! Better still, get one for yourself and several for family and friends, and you'll all have a holly, jolly, Christmas - with an edge! I hope they are back next year. Ordered 1 wished I ordered 3 stocking was loaded with an assortment of blades worth 3 times what I paid. The best mystery buy I had so far!! I purchased 4 of these, and although everyone enjoyed them I was disappointed to see the contents of all 4 were exactly the same. The description leads you to believe that they are more randomly filled. That is obviously not the case, but it is sill a good value, and a good gift for anyone who likes knives, and I will probably order again next year. Hopefully they wont have the same items in them as these.